Some claimed Connery was 6'3", which I do not believe, Connery was a bodybuilder for a while, I think he was 6'2.5" in his youth, and while he was Bond he was 6'2" without shoes, I think he maintained that height into his 50s, but he is probably much shorter these days. @Filmfan G image the photo of Moore with Niven and Peck, he looks almost 6'4" LOL. he was taller but i doubt caine was 6'2. In the film "The Man Who Would Be King" Michael Caine is definitely taller than Connery. Rob, is it still worth mentioning that measurement at the top? I think 6'2" as peak height if the fairest choice. Sean was 58-59 in that period, so i guess he hadn't still lost too much, not more than 0,5" for sure...they were both 6'1.5" in 1989. Measured at 6 ft 2.4 in his early 20s, was probably still close to that height till the late 90s, early 2000s. Nowedays he might have dipped below 6 ft 1. 184-185 now and 188-189 peak. No Mike, I absolutely disagree. Most of the pictures from Connery and Murray where they stand together or face to face are very bad for a correct comparison. Murray talks about his height in his Twitter (6'1.5 - 187cm) but I can' believe that because his coach Ivan Lendl (former World Number One and great tennis player) is 6'2 (188cm) and I don't believe it that he shrunk for age 54 and Murray is slightly taller. Maybe 6ft 1 but no more than that, and most likely 184. Really? He looked more 6ft range in some of them! Sean was definitely 6'2" in his prime, not sure about today, but he was and still is the best James Bond. I grew up in a time where Roger Moore was Bond, Connery was the best and still is the best Bond. Apparently the producers saw Connery in Timothy Dalton and Pierce Brosnan, but nothing compares to the original. Haven't seen it but is The Offence really better than The Hill, Arch? That's my favorite underrated Connery film...not a huge stretch for him in that performance I guess by a really solid, good movie. The Offence I reckon was his greatest performance (that I've seen anyway). It's British spelling The Offence actually. Rob can you add a photo and films like Marnie, The Offense, Murder on the Orient Express, The Man Who Would be King, Highlander, The Hunt for Red October and Entrapment. The Offense is one of the best movies of his I've seen. Watching The Rock and he's easily got 2-3in on Nicholas Cage who I still wouldn't argue below 6ft. That and he has 1-1½in on 6ft1-6ft2 Michael Bay. I think Sean Connery was 6'2" while he portrayed James Bond, he might have been 6'2.5" in the morning. He definitely lost height as he aged. I think he was about 6'1" when was in Indiana Jones and the Last Crusade. He was only slightly taller than his co-star Harrison Ford, who I would guess was around 6'0.5" in his prime. Back in The Man Who Would Be King time, Connery and Michael Caine were very similar in height, more mm than cm between them. Although Sean is only a few years older, I think the pictures of them together show Connery started losing height a little earlier than Caine. Sure Ytr and Donald Sutherland was 6'5" and Clint Eastwood 6'5.5". 6'2" peak, not 6'3". He's more like a flat 6' today which you can see on his long legs that make his torso look very out of proportion. He's gotten the "Clint syndrome". I doubt he measures over 6ft 1. 185 is his max today. Rob, was Connery still 6ft2 in Indiana Jones? He seems considerably taller than 6'0.75 Ford back then. 6'2 seems okay for his peak. In never say never again he might have been 6'1.5. If you look at him compared to pat roach or Rowan Atkinson in that film I don't think he looked a full 6'2. Rob do you think Connery was likely no taller than 6'1.5 in 1983 when that film came out? Might be as low as 6'0" nowadays, he is turning 84 later this month. Don't doubt 6'2 peak. Arch Stanton, we have to remember that he was always a heavy smoker. The nasty habit tends to do that to you. Connery said 6'1.5" himself as well, did he not? He could look a genuine 6'2" at times, but he didn't next to 6'4" Bernie Casey in Never Say Never Again. It amuses me that even in the face of valid info, some people still refuse to change their opinions. This sense of arrogance could in fact be why the world is so F'd up. Eon released the Bond heights. Eon is the company that produced the Bond films. Their tailors measured each and every Bond actor. Conner: six feet one and one half inch. They didn't list Craig, for some reason. Maybe Connery is an out of bed 6'2" and dips a half an inch during the day. That is my exact height by the way. Or maybe he is 6'1 and 1/2 out of bed and was measured early in the AM. Who knows? But please, let this end the debate of who the tallest Bond was. It is Timothy Dalton. Connery is most likely a weak 6'2" and let's leave it at that. Really, i trust EON over anyone else on this site. They, you know, actually MEASURED him. 6ft 2-6ft 3 (188-191 cm ) peak 6ft 0.5-6ft 1.5 (184-187 cm) today. Also when being surveyed in The Anderson Tapes one observer estimates him as Male. Caucasian and 6 ft 3! He aged a huge amount between 1962 and 1972, in the Anderson Tapes he looks almost old enough to be the father of himself in Dr. No and looks more in his 50s than 40s. In a dressing gown barefoot in the Anderson Tapes, he had to have been around this, but I honestly can't see 189 or 190. Yeah next to Atkinson he looked under 6'2. Atkinson at 5'11.5 is possible and Connery 6'1.5 -.75 is possible too. This seems fair. Maybe 6'2.25 peak. So Rob you think Rowan is 182cm?, you currently have him at 181cm on the site, he definetly does look 6ft in shoes though id say. Rob in Never say never again, Thunderball remake Rowan Atkinson was in that film he looked 6ft with Sean Connery do you think Rowan was a 6 footer back in the 80s? Do you think rob 6'1 1/2 is unlikely for his peak? Indeed, Jake. Flaming was supposedly angered at first because of thinking that Connery was too robust. He was still looking 186-187cm a few years ago. No doubt a 188-189cm range guy in his 20s-30s. For his generation he technically a giant. Sean Connery was 6'2" in shoes when played 007 small head made him look taller' in 2010 no more then 6'00" my dad stood next to sean connery in 1974 dad was just bit taller at 6'2"
6'1" to 6'1,5" is fair for him when he was younger. Yes, Dave, I seem to recall reading that from the Bond tailors. Well, Connery was/is a pretty sturdy 6'1.5 guy. As an aside, and in my opinion, those Bond suits were best from the first 2 movies. All 70's suits should have been burned. I read a thing from the Eon tailors--Eon was the company that produced the Bond films, and the tailors were in charge of making the various Bond's suits. They listed Dalton as the tallest 007 at an even 6'2". Connery and Lazenby were 6'1 and 1/2 inches, and Moore and Brosnan were 6'1" even. They didn't list Craig. SInce these dudes were measuring the actors for their various suits, I imagine this is pretty accurate. I believe Connery is 6'2" out of bed, and dips to 6'1 and 1/2 after a while. The 6'2" and 1/2 measurement from his bodybuilding days was probably in shoes. ...Granted, I see some sagging skin in Never Say Never Again (not abundantly so, just normal for a 53 year old guy), but to me, Connery looks quite lean. I know a line in the movie says he's 190, but whether or not it's accurate, I don't see him as heavier than any previous Bond outting. He certainly looks fit. As for my 201 figure, I'm just going by an actual qoute of his from the late 60's. Interestly, I just cught an old Battle of The Network Stars ('77) 2 nights ago, where Patrick Duffy was listed as 183. To my knowledge, Duffy was/is 6'2.5. But, "he" was lifting weights alot in '77. So, if Connery really was 201, the guy was maybe not buff in modern terms, but solid. Rampage watch Last Vegas, Freeman does look near 6'3 in it. Connery was described as 190 pounds in Never Say Never when he looked way heavier than he did in the early 60s. I've read 176 or 8 pounds for him in early Bond which seems lower than you'd expect but he was pretty slim. Never Say Never Again though no way was he under 200 pounds!! Maybe this has been covered, but I read an interview from way back where Connery, himself, described his weight for his latter 60's Bond movies as around 201 pounds. You can't be a 200 pounder, profess that swimming and occasional football and golfing is all you did for exercise, have no detectable bodyfat with your shirt off and not have some height to you. Granted, he had/has a sturdy frame. And though he may have weight trained years earlier, I've read no comments about doing that during his Bond years. Again, he had to have had some substatial height on him to carry 200 that well in, say, Thunderball. I used to think 6'1 plus. Now I'm wondering if 6'2 plus is more accurate. @Arch: Freeman looks nowhere near 6ft3 today. He barely edged out Christian Bale. In his prime he could definitely look near it, though. Maybe 189-190cm in his day. 188cm max now though. 188-189cm peak for Connery. Still looked a strong 6ft2 in The Hunt For Red October aged 60 opposite a young Alec Baldwin and he was still looking 186-187cm just a few years ago, so likely is 6ft1ish now. Freeman always looked taller on screen to me than Connery. Even now Freeman can look near 6'3". Connery is 6'0.5 max today. I think Connery stayed at 6ft2 mark well into his 60s. In The Rock he looked about 6ft3 with Nicolas Cage and that was 1996. I'd be amazed if he came out as only 6ft now. Clearly above 6'2 at his peak. "BIG tam" was the tallest bond and was probably between 6'2 - 6'2.75 at peak. Yeah, Connery and Freeman looked like guys may have scraped the 189cm mark in their 20s-30s. Whereas the likes of Caine and Warren Beatty may have been closer to 187cm. It seems really pedantic at times when we quarrel over a couple of centimetres! "Peak height was 6ft 2.5in (189cm)"
"Sean Connery's height is 6ft 1in (185cm)"
Hey Rob, have you seen the photos of him with Ian Fleming who's listed at 6'0"? Sean really doesn't seem to have 2 inches on him, maybe 1-1.5 inches max! Plus in these photos, Fleming seems to be well into his 50's as well! What do you think Rob?? Rob why did you take away the mentioning of the 6'2.4 bodybuilding measurement? Connery at 6'1.5" though puts Anthony Perkins at 6'0.5" and john Gavin at 6'3 etc, although Donald Sutherland did have about two inches on Connery and I think he was a slightly shorter than Clint Eastwood peak. Rampage Connery had about an inch on Anthony Perkins in Orient express who Rob has at 6'1.5" on here and looked 188-9 next to Vanessa Redgrave. Costner is/was for sure at least a solid 6ft1in in his youth. Connery could appear noticeably taller in some scenes and just barely taller in others. It's fair to say that he hovered around the 6ft2in mark for quite a while. For sure in every scene and still from The Untouchables where they are standing on equal ground, Connery seems a solid inch taller than Costner. Saw The Untouchables last night, first time in about 15 years. Hard to decide how he fared next to Kevin Costner. At times he could look 1-2 inches taller, at other times they looked the same height. He looked 6ft2-3 aged 66 next to Nicolas Cage in The Rock. I don't think he looked quite as tall on screen as Charlton Heston Rampage. He really was incredibly tall Napier, and very broad shouldered despite his skinny frame. He looked a lot broader than Connery who was obviously a well-built guy himself. If you watch Marnie you'll see he really doesn't look under 6'2" next to 6'6" Alan Napier, if anything you could argue 189cm more than 6'1". But Napier was one of the few guys Connery ever stood next to on screen which made him look average! He was measured at 6 ft 2.4 back then during is early bodybuilding days when he was in his 20s, but i'm fine with this height listening, it's probably close enough to the truth. Full 6'2 but who knows the tailors may under measure by .5 or more. I agree can give stronger 6'2 impression. Which Bond movie did you get the highest impression he was more a 6'2 flat guy? I agree he's about 6'2 not 6'3 like I saw before in some sites. Wasn't he measured at 6'1.5 by the Bond tailors? Not like it matters, I personally think he was the full 6'2. Yes, he does look strong 6'1" range in some of the photos. "Peak height was 6ft 2.4in (189cm)"
Is documented as being measured at that height and as being the tallest actor to play James Bond. Not buying 6ft1.5. He edged out Michael Caine. Eh...Arch you need to look at those pictures again. He looked barely shorter than Murray in some of them and in others maybe 1in shorter. I admit that he can appear barely over 6ft now. But, if he stood for a measurement I'm confident he'd be taller than you think. Rob I see you say you used to have him at 6'2.25 189cm. What was the reason for the downgrade? I can still believe that he did measure 6'2.4" earlier in the day in his 20s though can't you? Not sure he'd measure over 6'1" today Rampage. He looked 184 tops next to Andy Murray. I can believe that he measured 189 earlier in the day as a young man, but remember that he claims 6'1.5" and that was the height he was measured at for Bond and he did look minimum 2 inches shorter than Donald Sutherland. I think 6'2" peak is fair though. I also think that Connery was while playing bond 188-189 cm. Never under 6'2 in his youth. Rob, didn't you originally have Connery at 189cm? and usually looked both at times. 189cm peak. "Connery; Peak: 6'2" Current: 6'0.5"
Lazenby; Peak: 6'0 Current: 5'11"
Moore; Peak: 6'1" Current: 6'0.25"
Dalton; Peak: 6'2" Current: 6'1.5"
Brosnan; Peak: 6'1.5" Current: 6'0.75"
Craig: 5'10" (Camera angles and lift boots akin to Tom Cruise's make him look taller)"
Lazenby, 6'0"?? Lolwut? He was clearly a strong 6'2". To say he was slightly under is madness. A lot of them are fairly accurate. But some are a bit iffy. The Jim Carrey model looked about 6ft. Travolta looked 6ft2! But i think this time they got it right,lol, precisely the height that you guessed for Connery on 20Jan2013,Rampage!Madame Tussauds is probably as close as i will ever get to a celebrity,lol. I've been to that wax museum and got the impression they tried to approximate the celebrities' heights. For some reason the Wayne one has his legs spread and isn't standing tall. I seem to recall Mick Jagger's was in also in a height dropping position and had, for some reason, a blonde wig. Most of the wax figures looked pretty close to their celebheights listing, though. The Madam Tussauds wax models are useless for guessing height. I'm just over 6ft3 and John Wayne was slightly shorter than me and it's common knowledge that The Duke was a solid 6ft4! finally the photo:under this is the photo with me and Sean Connery and another guy in Madame Tussauds,i am on the left of the photo,i am 6'1. P.S.Rob,thanks for the imgur hint! Looks about 6' to me,and I don't think that he has shrunk, but unless you see an actor BAREFEET, all those height discussions are a waste of time. i dont know if i can upload a photo,how to do it? 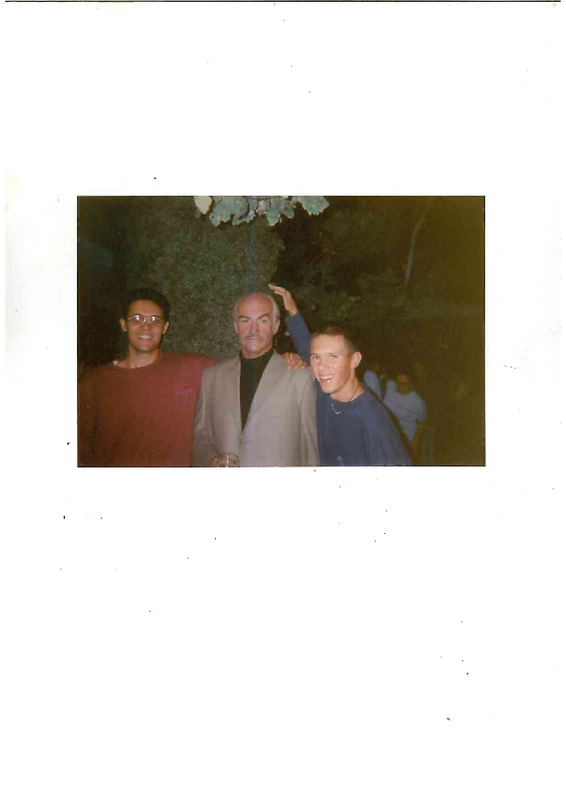 i will upload a photo taken in Madame Tussauds museum in London in 1998,i am on the left of the photo,i am about 185cm(6'1),theres me on the photo and waxed Sean Connery and another guy. He appeared to be the same height as Kevin costner in the untouchables who's 6'1, or even .25 inches shorter at times maybe .25 inches taller at times too so 6'2 maybe in his peak but certainly not now. The mans 80 some odd years old I'd say he's still a very tall man. He was never a legit 6'2.He has always been 6'1.5 barefoot as measured during his bond era and in those years he was a young man in his early 30s so he could'nt have lost height.Rob why is it that except for Timothy Dalton all the bonds have been listed half an inch more than their actual barefoot heights?? 189cm peak, A FACT. I think the 6ft2.4 measurement was legit, and that he was 6ft2.25 by the evening. Not to mention he was a tad taller than Michael Caine, and 3-4cm taller than 6ft0.75in Ford at age 60. Come on, man! Lazenby didn't look 6' 1.5" last sunday when I shook his hand. Most of SC's 007 co-stars told me 6' 2". As listed. *I screwed up on Lazenby's. I didn't realize his current height was supposed to be 6', he also turns out to be closer to 6'1.5" on closer inspection. Connery; Peak: 6'2" Current: 6'0.5"
A few years ago (since 2000), while on the David Letterman show, he claimed to be 6ft.1.5. He's still well over 6'0 today in his 80's. @Shaun: yeah I do think he was 6ft2.5 peak..and yes he probably has lost a lot of height. He's 82 bloody years old! He looks 1-1.5in shorter than Murray. He looked a full 6'2" peak but nothing more. Shaun would that mean that Connery was 187cm? Rampage so you still think Connery was 6'2.5"? Compare him to 6'2.5" Andy Murray today. He must have lost a lot of height. Well in Diamonds are forever he looked 190cm but probably not over 188cm peak. Actually he looked 1-1.5 inches shorter than 6'3" Jimmy Dean (WiIlard Whyte in that film) but I know what you mean. Connery of course was a bodybuilder for some years as a younger man too so also taking that into consideration. 6 ft 2 for him now anyway is literally impossible seeing him next to Andy Murray. But in all fairness Connery's height loss has been quite slow, as you say he was still looking a strong 6'1" by his last film. 1.5 inch height loss for an 82 year old man is under average I think based on the 1 inch per decade over 60 don't you think Rob? Yeah I quite agree with you. I reckon Connery and Eastwood should have a face-off! I think they could both possibly be 185 at some point in the day if stood as straight as possible but I seriously doubt either of them are over 6'1" anymore. Eastwood can still look a full 6'1" on occasion though and then barely look 6' at other times. Rob what height would you estimate him today? Rob what height would you estimate him today? I think he could be about Eastwood's height today 184-5 cm? Yeah Josh definitely has the Eastwood factor in that pic! Looks 1.5-2in shorter than Murray. But I'd say a prime Sean Connery would've stacked up well next to Murray. @Shaun very long legs in the murray pic, looks to have lost upper body height like Eastwood. Now I would guess around 6-0" by looking at him next to andy murray,has lost 2" imo. Rob here he is with Andy Murray. He looks close in one photo and then easily 2-3 inches shorter in some of the others. If I had a guess I'd put Connery at '6-6'.5 today, but he's 82 and has likely lost an inch or or two. Last I saw of him he looked quite ill and wondered how long he'd last but he looks superb in these photos, fantastic for an 82 year old guy, looked tanned and healthy. A bit under the 6'2.5" mark in his prime. In Dr. No, Connery looked to be edging Anthony Dawson (who played Professor Dent) a little. I've seen 6'2" listings for Dawson, and I wouldn't really buy that he was shorter than a legit 6'1". So I would say that Connery gave the impression of pushing towards the 6'3" mark in that scene. i think roughly 6'3 (190cm) is what he looked in diamonds are forever. I wasn't talking about the whole movie, but that scene in particular. I just watched Diamonds Are Forever. I am willing to give Edgar and thebad7 right and admit myself to stand corrected when coming to the discussion we had a few months ago when arguing about Connery's leg length. In the scene where he is meeting Felix and his crew, Bond is seen without a jacket and his proportions are shown quite clearly. His legs came off as very long. I'd say that I had a solid 6'2" impression in that scene. In Diamonds Forever yeah he did give off a 190cm impression at times. I'll admit he could often look very similar in height to Challenger #5 and Hugh's 189cm claim often didn't look too far off. I do think the 6'2.4" measurement might have been legitimate as a young man at some point in the day. To me he looked a full 6'2" in most of his films if I'm being perfectly honest. James look at his legs in the hallway of the Miami hotel in Goldfinger, difficult to see him under 6'2". Lets not forget though he was 2-2.5 inches shorter than legit 6'4" Rik van Nutter in Thunderball and that legit 6'4" ex Americn footballer in Never Say Never Again so that really but anything like 6'2.5" out. Shaun for christmas i got the james bond ultimate dvd collectors set with all the films so far so maybe i can study connerys height. Here's 6'4" Rick Van Nutter with Anita Ekberg, Looks uncannily like Clint Eastwood in body size/face shape. Does look to have the proportions of a legit 6'4" wouldn't you say James? Nope, he dwarfed Robert Shaw and he was considerable taller than Pedro Armendáriz who is also on the tall side. Remember Shaw was wearing big lifts in his scenes with Connery as he was only 5'10" and they needed to make him look more imposing. @James: With dress shoes, he always looks 6'3", especially in the Bond Films. Also, from the same period he did a great noir film from 1961 titled THE FRIGHTENED CITY and he worked with Alfred Hitchcock and Tippi Hedren in '64 for MARNIE. He looks 6'3" in dress shoes in those two as well, which corresponds to 6'2". That '50s bodybuilding measurement carries more weight for me than the Bond Tailors' shenanigans, coupled with the fact that he always looks noticeably taller than 6'0" and 6'1" actors, even well into his 60s. 6'2" I always bought for him, but after recently watching him in 1975's THE MAN WHO WOULD BE KING, I starting seriously considering whether some change ought to be added to that 6'2" for him. He is at least a half inch taller than 6'2" Michael Caine, and what I really noticed was how long his legs are, especially in scenes towards the end of the film when Connery wears only an old-fashioned tunic. yeah i agree with you on that. connery always looked tall even in his later films. LAN Jiao i think connery would have an edge on clint eastwood. 6'2.4 during age 20-late30 , 6'1.9 from age 40 to mid 50 , 6'1.5 from age of late 50 to mid 60 , mid 60 crisis make connery to drop 0.75 at late 60s of age 6'0.75 to currently. may dip under 185cm today. not under 184cm. maybe same height as clint now. Also, some posters mentioned Connery himself saying 6'1 1/2" on one of the late night comedy shows (I can't remember which one it was). He's always projected himself as a strong, confident guy offscreen, and I wouldn't be surprised if he made a joke of his height by saying that. Actors are very aware of the gravitas surrounding a man's height. I always liked Connery--he had a great screen presence. It's too bad he is fully in retirement. do u guys agree that in russia with love connery looked like 6'1? Roch looks 240-250 pounds. Connery looks about 210 pounds in that film. pat roch looks like a solid 6ft4., then again is a fight scene and is not a very good height reference, i think the best moment 2:12 when connery is just abau to punch him, also connery is in boxing position, no to mention roch is a good 30 pounds havier that connery wich makes him more imposing. Also, the scene and camera angles indicated that this in this scene was meant to look bigger than connery(the camera sometimes i deliverated by his side, or when facing connery he straight and connery not). Difficult to tell but probably around 3 inches. Pat Roch definitely looks a legit 6'4.5". Similar height and frame to Sven Ole Thorsen. that would mean connery would have been 6'1.5 then? Guys i wonder how much of a gap there would be between clint eastwood and connery if they stood side by side in the 1960's? 1.5 or 2 inches? also, in that movie donald was nearly pure flesh and bones, wich give him the advantage of longer body while sean was more build. Shaun how tall do you think connery looks next too 6'4.5 Pat Roach? this was the early 80's so connery could have been a hair shorter than his peak at this time. I'd like too see how pat roach would do up against that 6'8/6'9 Blonde guy. If you pause just as 0.08 approaches you'll get the best perspective as they are just about level. Connery actually comes up to the base of Ronald Rich's nose. I'm getting a 6'10" impression in that scene James, what do you think? This clip is much better. I'd say Ronald Rich looks easily 6'8" here and at 0.03 actually looks 6'10" range due to him being closer to the camera. Pause at 0.08 as Connery passes. Connery is level with his nose, that's about 6 inches. He;s a massive guy does look legit 6'8-6'9". Here's the scene James. Actually 6'8" looks about right, doesn't look 6'10" really, difficult to tell as if Connery is hunched he can look a foot shorter! !, looks like he'd have about 6 inches on Connery but dwarfs him in body size. @ James WTF 36 inch inseams at 5'9"????? CLint Eastwood who I think has 36 inseams looks ridiculously out of proportion at a weak 6'1" , 5'9" you'd look barely human!! LOL 36 waist. We are talking about legs James!! Are you sure that you weren't writing about waist sizes? James, if you are 5'9" or 5'10" with a 36" inseam, then you have freakishly LONG legs. 36" inseams usually come on 6'4-6'6" guys. james your claim is the weirdest one that i ever heard, i never ever have a change in my inseam, when i was skinny(for my body type) i had a 32 inseam, but know that i am havier(for advice of my doctor) i still the same, are you sure you measure your inseam well?, because to lose 6 inches in inseam is kind of odd, not to mention that you said that you used to have clint legs. i don't have clint legs.. my legs are very short for my height but i have a long torso. possibly before my jeans were too big for me..? Was sean connery maybe just stating his current height in 1996 on the jay leno show? If someone could locate a copy / transcript of the Tonight show interview with Jay Leno in 1996(episode 921 20 May) with Sean Connery then all this would be sorted out. Connery says 6'1.5"
Connery was the classic mesomorph though wasn't he. He could look 220 pound range in recent decades although recently doesn't even look 200 as he's been ill I think) but if you watch Goldfinger for instance and him walking through the hotel corridor and in the hotel room in Dr. No when he's setting the traps. I would be surprised if he was just a 32 inch inseam. His legs looked long, 34 inseam surely. shaun i am only 5'9 or 5'10 but when i worked out at the gym and bulked up 2 years i had a 36 inseam. If i was connery height off 6'2 my inseam would be like over 40 maybe? Although its not often that you get 6'2 people who are mesomorphs its more average height guys like 5'10 who have that body type. generally tall or very tall people have ectomorphic body types and are hardgainers when it comes too muscle like clint eastwood or hugh jackman... people were shocked when i told them i had a inseam off 36. now that i have stopped working out my inseam is only 30.
i am not sure if connery was a classic mesomorph since he could look kinda lanky and slim at times. But yeah his muscular build could make him look shorter like 6'1 in his bond films such as from Russia with Love and Thunderball also that 6'9 guy made connery in you only live twice owned sean connery. That 3rd photo of Edgar's of Connery you'd be hard pushed claiming he looks lower than 6'2". Connery actually looks 189-190cm in that photo. "Bond tailors" => Ridicolous fan-website with no reliable sources. Viper, Connery was 6'2" or more, like it or not! lee marvin was short legged, and it was noticiable, but in other side marvin had a very long head, connery is more leggy than marvin, there is one shot of marvin siting and he needs to bend his bad to his knees tuch the lower part of his torso( if you know a 5ft 10 with 30 inseam, you know this efect) for connery o cant find a photo with a perfect sideways angle but in most photos when he is sit, his knee come up to his shoulder very easy, i think shaun know what i am saying. also connery have a natural high waist and a peculiarity that i just notice is that cpnnery have a tibia as long as his femur, wich sometimes makes a short leg efect, plus, connery have very muscular legs, also this give other clue abaut his long legs, because connery have said that he lost the mr universe contest because he had bad calfs, alot of bodybuilder said that the longer your legs are, the harder is to put muscle on it, just ask shwarzenegger. By the way, 32" inseam isn't THAT short for 6'2". There are some 6'4" guys who have a 34" inseam and they are usually not considered short-legged, as far as I know. Phelps has a 32" at 6'4. I wrote that it's MORE COMMON for men up to the 6'1" range to have a 32" inseam and meant that if Connery really had a 32", it would support those who argue that he is and was 6'1" and change barefoot. I'm this height range and I wear 34 inseams, and I'm big torso build opposed to very long legs and short body. 32 leg at 6'4" is unusually short for that height but they say Phelps has the torso length of a 6'8" guy and the legs of a 5'10" guy. My other post didn't get published. Matt Spaiser said that Connery had a long torso. "Sean Connery was 6'2.5" tall, and so probably would be a long length. I'd suspect his chest size is about a 44. It was popular in the 60s, as it is now, to cut the jacket on the shorter side. They were cut shorter to lengthen his legs because much of Connery's height is in his torso. That's one reason why his trousers had a very long rise. The key is to make the legs look the longest possible whilst still keeping everything proportionate. And I would believe that Connery has a 17" neck. Cary Grant had the same and he was skinnier than Connery." @Henrik: Interesting where you found the 32" inseam. That guy is a dead ringer for Sir Sean! He could be a 32" or a 34" inseam, but my best guess is the latter after seeing him in 1975's THE MAN WHO WOULD BE KING. Towards the end of the film, Connery is dressed in a tunic, and there are several shots in which you see his bare legs; I knew he was tall, but I was shocked at how long his legs were after paying attention to it due to the activity at his page. As poster James said: he was, and still is "strong tall." henrik, you realy trust in that site?, is from a sean connery look alike for god sake. also if he was measurament in that way, was from 60s stile of clothes that he wore in the bond films, where his pants were always at 2 inches above the heel of the shoe, where is not the real inseam. Nic Cage has never seen 6-0 in his life. And there is no evidence of Ford being a solid 6-0 at peak. Connery has never been 6-2, ever. Hes a 186cm guy. sure there is, the mugshot from the fugitive. No doubt he was a tall man in his prime..not super tall by any means but still i would label him as 'strong tall'. @Edgar: Nice article on the in's & out's of tailoring. Very informative. I agree with you: Connery is a 34 inseam for sure. Some people refuse to accept the fact that Connery is 6'2"+ and the man always looks it--from 1961's THE FRIGHTENED CITY up through to FINDING FORRESTER (late '90s, I think). I just watched him last night in 1975's THE MAN WHO WOULD BE KING. He's a fraction (about 1/2") taller than 6'2" Michael Caine. This film is a good template because you see Connery in flat sandals or barefoot; wearing only a robe, you can see how long his legs are. Even in flat sandals, he's still a shade taller than Michael Caine. After watching this, I'd go with 6'2 1/2" peak for Sir Sean--his look in KING corresponds to that early '50s bodybuilding measurement. i dont know guys but this guy dont look a short legged guy, dont even a short guy, in fact looking the very short heel his shoes have(connery in fact after seeing alot of his photos is a fan of short heeled shoes), look to big to be just pierce brosnan size. I also wear a 32 inseam, connery by no ways wears one. it says cleary, that pierce brosnan requiered to have an extra 7 cms in his pnats to look more proportional(he will suit your phelps description much more than connery), and his jacked to be 4 shorter, the actual tailor of other james bond said that the suit make magic because he looked taller and as good as connery, despite the fact that the tailor claims that pierce brosnan was in fact shorter, now lets get this straight, pierce brosnan has been described as an strong 6ft 1(never 6ft 2) and the tailor describes brosnan as shorter, so connery must cleary taller to the actual tailor Angelo Petruccini. also, the fashion of the time marks that the pants must be around 2 inches above the shoe, look alot of movies of the 60s and you will se that most pants of the time were made abaut 2 inches over the shoe, it was to match the fashion impoused by england. is posible to hide long legs with a long jacked or with a fake inseam(like clint eastwood did in a few of his dirty harry movies) like this one. It could be noted (but it might have been already, I know that tailors have been mentioned and discussed a lot) that Connery supposedly has a 32 pants inseam. This is quite short for a strong 6'2" and more proportionate for men up to the 6'1" range, I suppose. 6'2"-6'3" men usually have a 34 inseam, as far as I know. But I guess there are exceptions, and that Connery might be a Michael Phelps Sr? viper you are becoming laugable, if you put cage to 5ft 11(never seen 6ft in his live like you said), and harrison for at 6ft flat, my friend i dont know what kind angle you look the pictures and photos. harrison ford was a solid 6'0" man at his peak. connery also had 2 inches on 6'0" nic cage in the rock. connery under 6'2" just doesn't add up. BS Viper he looked 6'2 well into the 90's as well. Im way more inclined to believe the Bond Tailors stuff because he flat out didnt look 6-2 plus. Its as simple as that. I can buy 6'2.4 out of bed, but as for his real height, he always looked nothing more than a solid 6'1. (Maybe around 6'1.5 daytime). Looks more 6'0.5 today. Lost an inch or so. No way was he ever 6-2 plus out of bed. Yes, I agree with 6-0.5 on his current height. NO,NO, NO Viper. It's not as simple as that. You're blind and you have a problem with tall guys. Connery was never less than 6'2" as a young man. The Bond Tailors BS is exactly that--BS. They refuse to confirm whether or not he was measured at said height; why should anybody believe them if they're going to play that silly game. The man always looked 6'3" in dress shoes in all his films--from the '60s well into the '90s. Furthermore, he's always been noticeably taller than 6'0" and 6'1" men and he holds his own against very tall men (6'2" - 6'4" range). You might as well get over the fact that Sean Connery was--and still is--a tall guy. Deal with it. @Ka: Agreed. He has about 2" on Harrison Ford in LAST CRUSADE--and he was 59 at the time! He had 1" to 1.5" on 6'1" Kevin Costner in THE UNTOUCHABLES from '87, and he had 6'0" Mark Harmon by 2" in 1988's THE PRESIDIO. Rob, which is more likely. 188, 189, or 186.7 cm at peak? @James: I don't know if I'd go so high as 6'3" for Connery out of bed as a young man. I would say 6'2 1/2" for sure and even well into older age. As mentioned, the 6'2 1/2" measurement carries more weight for me as it was done barefoot for his Mr. Universe competition. Either way, you've seen the films yourself: he was and still is a tall man. If he was truely 6'2 1/2 then he would be around 6'3 out off bed. Rob, at what time of the day do you think the 6'2.4 measurement for Sean was done, like 2 hours out of bed? Maybe 6'2.25 at peak? 6-1 and change was this guys peak height. I reckon the 6-1.5 measurement by the Bond tailors was in the morning. @James: You mentioned it before: he's kept his height. He's not like Clint Eastwood--a man who's shrunk a good bit over the years. I agree with you: in his prime, Sean Connery was a strong 6'2" man. I place more value in the barefoot measurement taken for him during his bodybuilding days: he was close to 6'2 1/2". Easily over flat 6'2". Also, I agree with you with regard to Carrey, Ford, and Cage. Even with Carrey, however, I thought that Connery had a slight edge. Bottom line: today, 6'2" out of bed, and strong 6'1" territory for the bulk of the day. Funny note: while watching THE ANDERSON TAPES, there is an early scene in which government agents conduct a surveillance operation against Duke Anderson (Connery). As he enters a Manhattan apartment building, an agent relays intelligence through his radio to HQ, and describes Duke as being "tall, six-three." I've seen too many films--just watch any Bond film he's in--where Connery is easily 6'3" in shoes. maybe 6'3 out off bed in younger days? Jiao: This is as good as the tripe you posted at Benicio Del Toro's page. Larry Fishburne is a weak 6'0" at best--he's more like 5'11. Connery was always 6'3" in dress shoes--be it Bond films or otherwise. Easy 6'2" barefoot. Get glasses and get over your beef with tall guys. Connery was a tall young man, and even today at 81, he's still tall. WRONG, Viper. As per your norm. sean connery did't look much taller than solid 6ft lawrence fisburne in 1995 just causes. 6ft1 flat to go. LOL, hes never seen 6-2 in his life. This guy was clearly over 6'2" in his younger days, like it or not.